The Game (aka Nine Meals from Anarchy): We developed this scenarios ‘game’ in response to the chronic stresses, long duration events and potential sudden shocks to the food system, and the resultant risks and resilience of local food supplies. Players are given a city, which is their job to ensure sufficient supplies of safe, nutritious food to their population in the face of events that have recently happened at the outset, then plausible events five and then ten years into the future. Composed by Sara Colman, and with a libretto by novelist Mez Packer, with two actor-singers, and musicians Xhosa Cole (who was voted BBC Young Jazz Musician of 2018) and Al Gurr, it was directed by Grame Rose and produced by Charlotte Gregory. It was a huge success, performed at two venues the city centre (Birmingham Bullring (on a sunny Saturday afternoon, when 2,500 people stopped to watch and many thousands more heard it) and in Victoria Square over a Tuesday lunchtime), and at Castle Vale, the home of the community choir who participated as performers alongside professional artists. The “graffeati project” we delivered in July 2018 as part of the Digbeth Dining Club Food Festival at Highbury Hall. 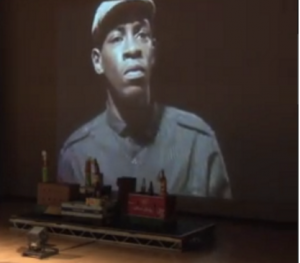 An Archetypal Household project which is a data research and writing project led by Suriya Roberts-Grey. Its purpose is to have memorable ‘archetypes’ representing x-% of households in the city, a somewhat crude but nonetheless useful way of assessing the impact of stresses, degradations and failures in food supply systems. This project is also part of our Action Research Programme. Its aim is to explore and quantify ways in which the city can contribute to food resilience and security at a local and national level, as well as globally. We’re designing the means by which we can record info about 1000 meals prepared and eaten in good company across the city. — Food Futures designed and developed by four young artists under the direction of Graeme Rose, with original musical score by David Allen Grey and performed at mac birmingham. 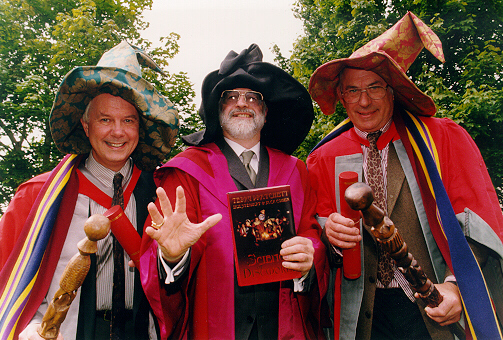 It was Terry Pratchett (centre in the photo) who coined the term ‘narrativium’ as the element upon which we humans run. The facts and stats of science have little easy appeal for many people. Yet, as Terry so memorably illustrates, all humans like a good story.